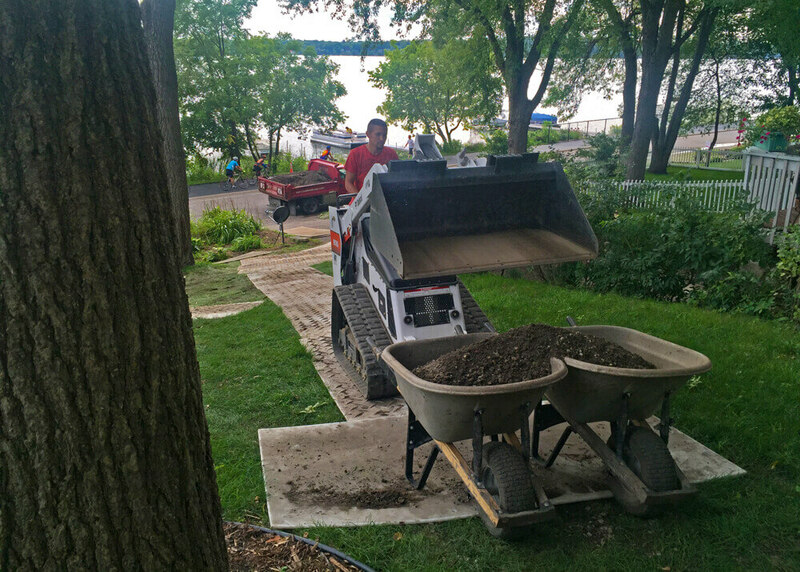 You CAN hire a landscape company that won't wreck your lawn... us! Now that you’re here and all excited to think about landscaping, why don’t I kill your happy buzzy feeling. It’s the topic no one talks about so early in the process: LAWN DAMAGE! Yuck. Hiring contractors and watching them make a giant mess while building you something new is no fun. Worse yet – what if they don’t clean up their mess very well, or at all? Then you’re stuck with the mess. The old way: lots of work, expensive! The old way: 3 months later! 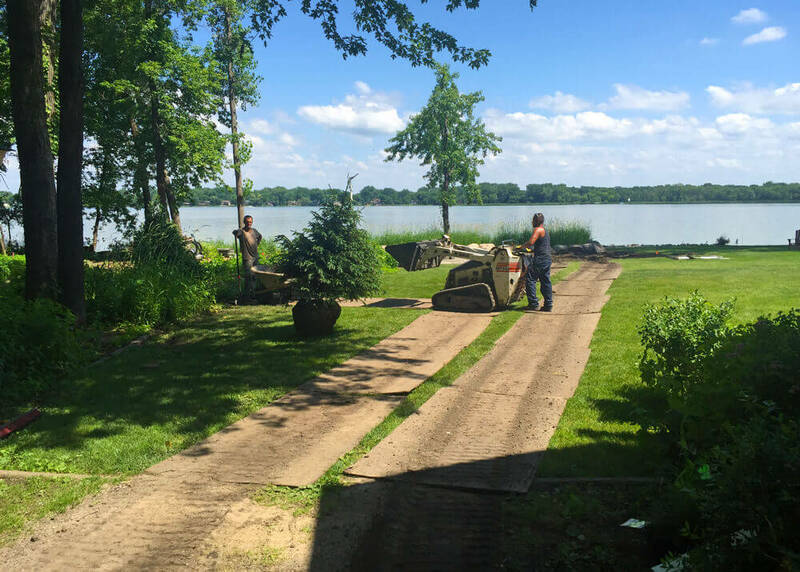 Nearly any landscape company you hire in the Minneapolis and St. Paul area will cause major lawn damage during construction– but we rarely do. 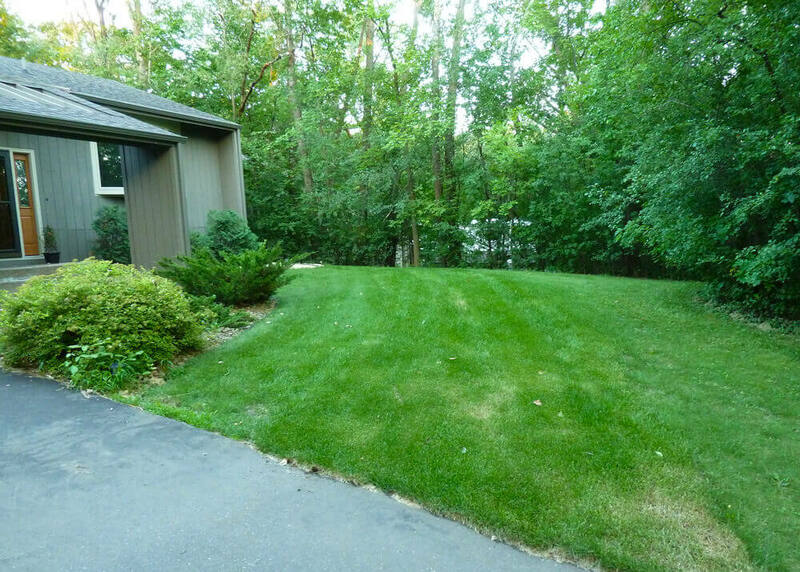 We have figured out how to minimize or eliminate lawn damage on most projects. It’s not always possible, but where it is, we will do everything we can to make the lawn damage as minor as it can be. This is one way in which we are very different from other companies. We’ve spent many thousands of dollars on gear to help us minimize damage, which gives you a much better overall experience. Let me tell you how and why we do it. New sod takes time to blend in with your old sod. It can take a couple months, or sometimes until the following year. 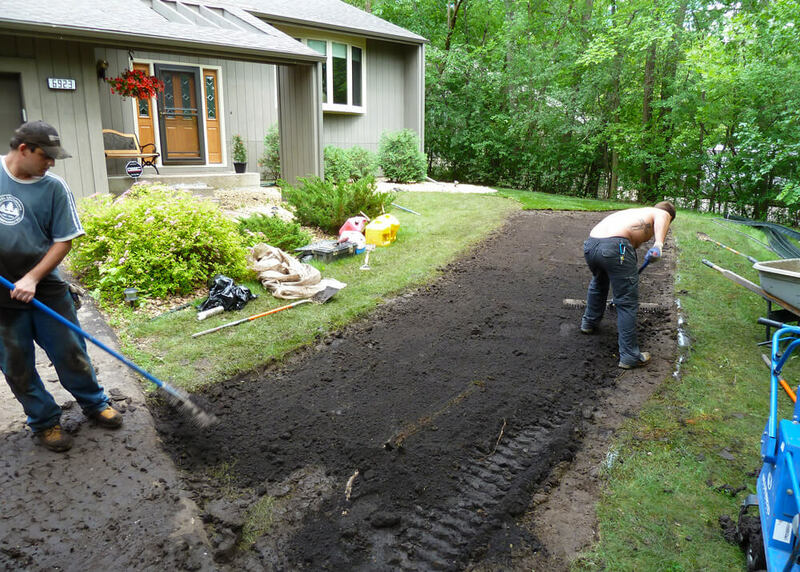 You have to pay for the sod/dirt to be fixed, which is a lot more work than you might think. Sod and dirt keep getting more expensive to purchase. 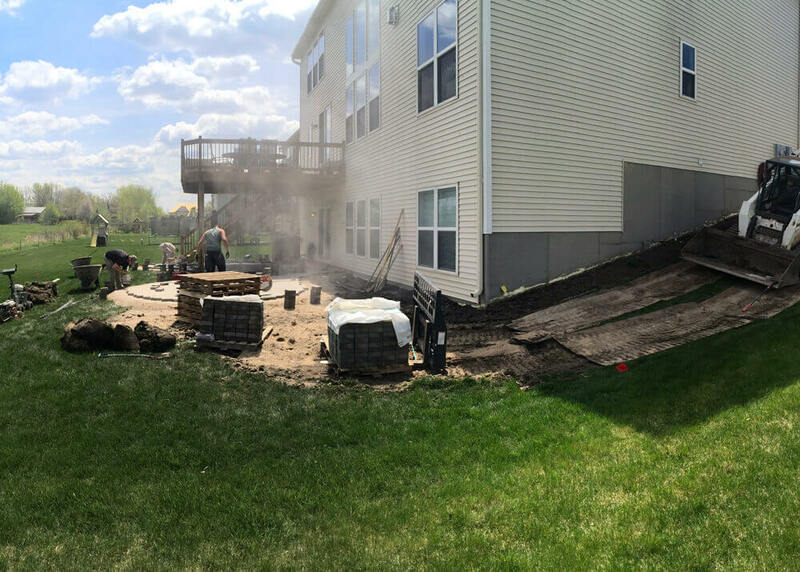 Sod repair always requires a hauling/disposal charge for the old material, and two delivery charges for the dirt and the sod. Every dollar you have to spend fixing damage is a dollar you can't spend on something fun and new in your landscape. YUCK! We used to do landscaping the same as everyone else. We damaged sod with our equipment and we were paid (as little as we could possibly charge and still do a good job) to fix it. Sod repair is no fun for us either. It’s messy work, especially if there’s been rain during the project. It makes the project itself more stressful, too, because the whole time there we’re watching ourselves destroy areas that we know we’re going to have to fix. We got tired of all this. We thought there must be a better way to do this work. 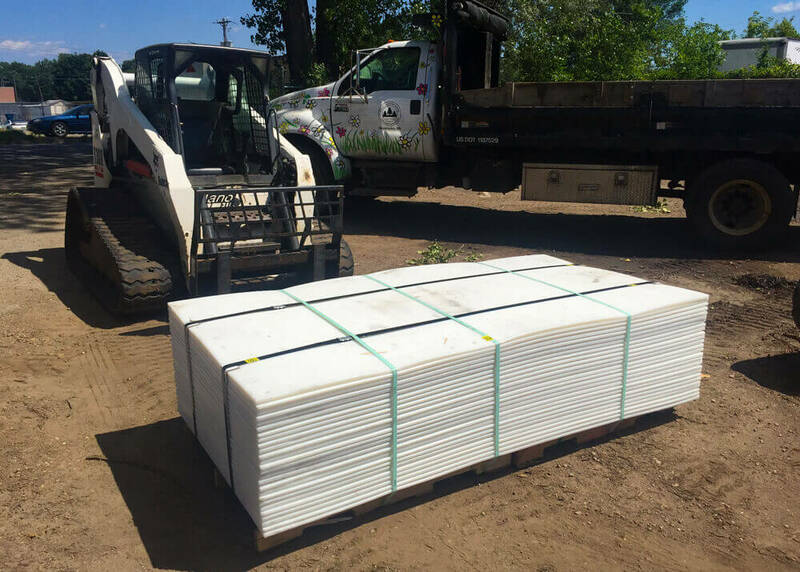 So some years ago we started bringing 26 sheets of plywood with us to every jobsite, whether we thought we’d need it or not. This allowed us to protect the lawn, in most cases, from the street to the back yard. If we needed to go further, we had another 30-40 old sheets at our shop we could bring over. 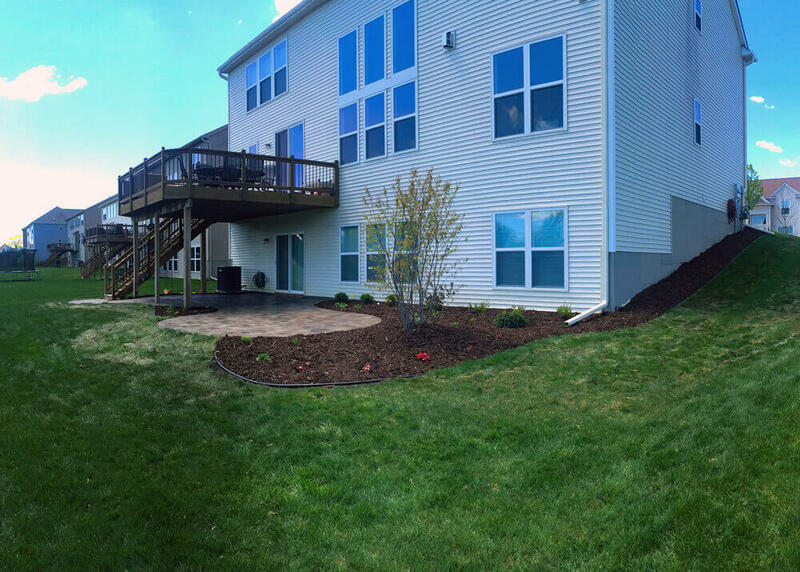 Below are some photos of a 2016 project where we brought hundreds of tons of materials in without hurting the lawn. Our Bobcats made hundreds of trips across the plywood. The plywood completely protected the main lawn! We put new sod by the patio. We couldn’t leave sod laying around for too many days and reuse it. Fortunately we had heaps of wonderful equipment and many years of practice installing these projects. 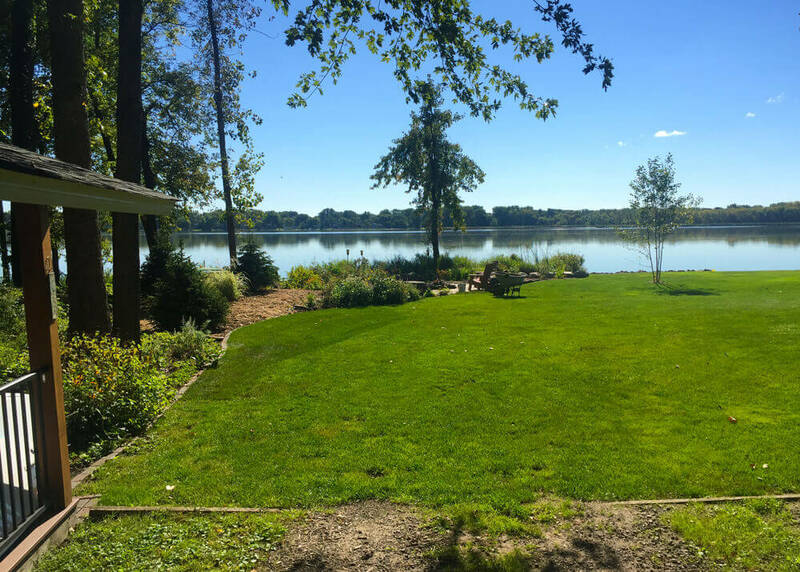 We could do a really good job of installing your project, and still get it done efficiently enough to be able to reuse your sod. We cut out and saved a bunch of their sod. 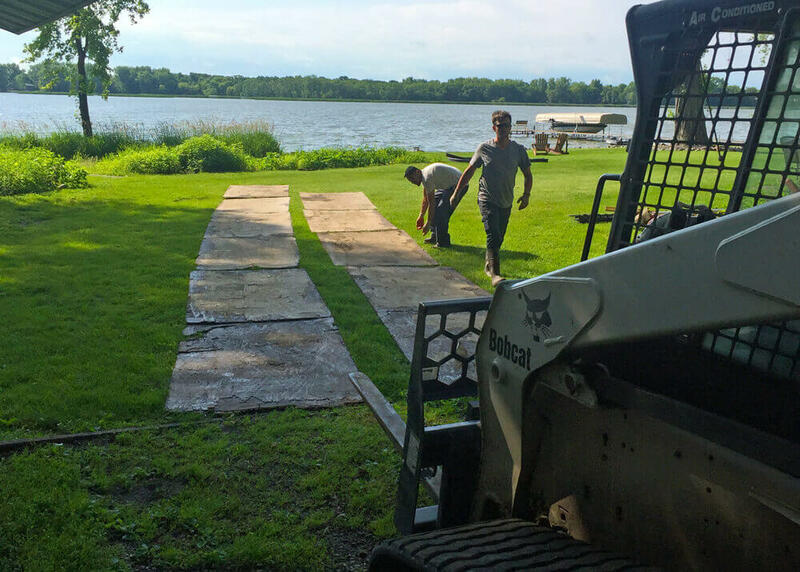 The plywood protected the path in, and their sod covered the lower areas. So, we had the plywood to protect the lawn we traveled across, and your old sod to patch the little stuff which always needed patching. But, the plywood was a bit of a bummer. When it got wet and muddy, which it usually did, it got SO heavy. After 2-3 days, we had to take it off the lawn to let the grass breathe and receive sunlight, then put it back in the morning, which was a lot of extra work. Over time the edges got broken and the sheets got flopsier and flopsier from use, until we had to buy a whole new set – usually once a year, for around $600. Our Greatmats in our storage yard in Hopkins. We wanted something better. After much research, we found composite ground protection mats by Greatmats. These things are incredible. They are stronger than plywood for similar weight, and they don’t absorb water so they don’t get heavier. They can be linked together so they stay aligned like a road. 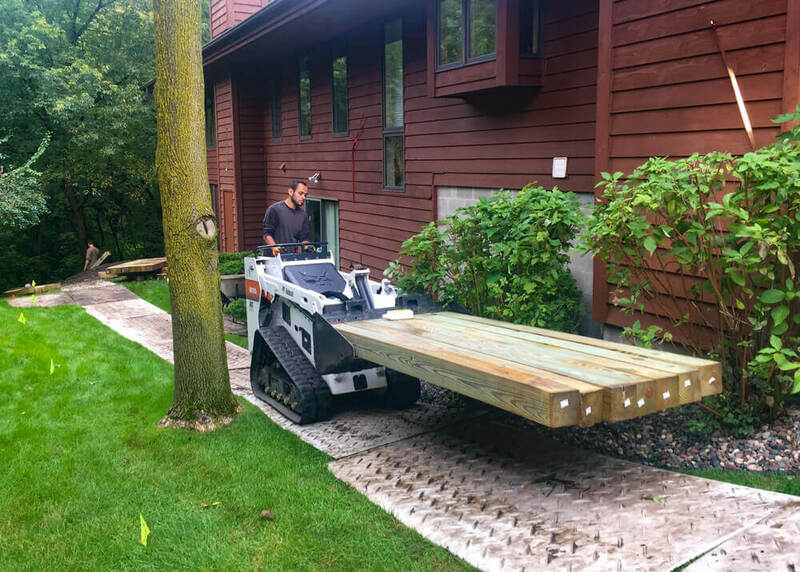 Two linked together make an 8×8 pad we can turn a Bobcat on once we get to the back yard. (Plywood squirms around so much, you can’t really make 90 degree turns on it.) Best of all – we bought transparent sheets, which allow UV light to penetrate into the grass beneath them. We can leave these on the ground all week and just pick them up before the weekend during longer projects. In short, they’re awesome! The downside? They aren’t cheap. $265 per sheet, times 26 sheets, gets us to around $7,000 we spent on these babies. How’s that for dedication to you and your project? 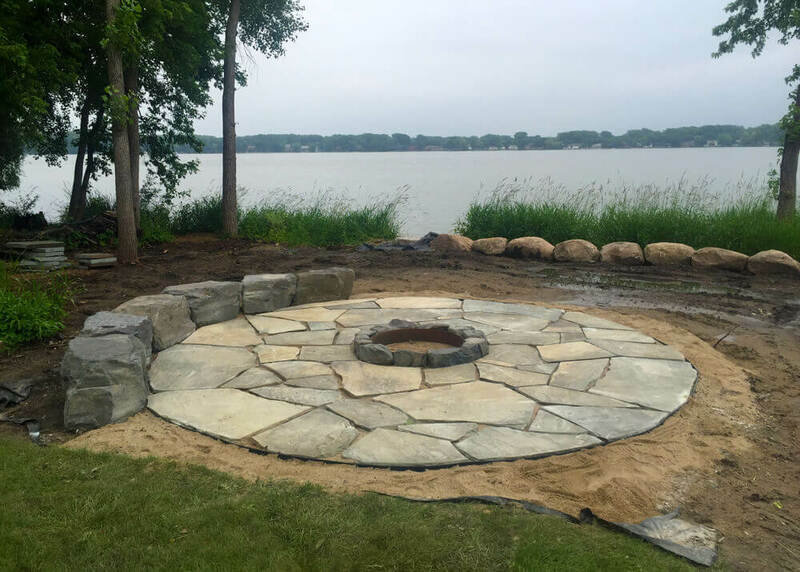 The sole purpose of buying them is to make it easier for us to avoid messing up your lawn, so you don’t have to pay us to fix it, so you can spend that money getting a bigger patio than you would have, or a sitting wall, a firepit, or something else fun instead. I absolutely LOVE IT when we can do a huge project with hundreds of tons of material coming in and out, making hundreds of trips back and forth with the equipment, and leave a minimal trace behind when we go. Often you can’t even tell we were there. The most important thing for you to know is that we care about all damage and we will try our best the whole time we're there to minimize it. Our goal is zero damage of any kind. It's not always possible to achieve that, but we try. It will always be far less damage than if we weren't trying to avoid it at all. It takes a lot of extra work on our part, but we like it this way and we think it's worth it. You and your neighbors definitely will too. The same conscientious ethic applies to your entire project. Much time and effort goes into designing and detailing on paper what your project will be. My wife Jodi does a great job of understanding what you want and don’t want, and will fit as much as possible into the budget you want to spend. Sometimes it won’t cost as much as your budget, so you’ll get to add more fun items or just spend less than you were expecting. She’s also very aware of access and is always thinking about physically HOW we will install your project to minimize damage or other issues. 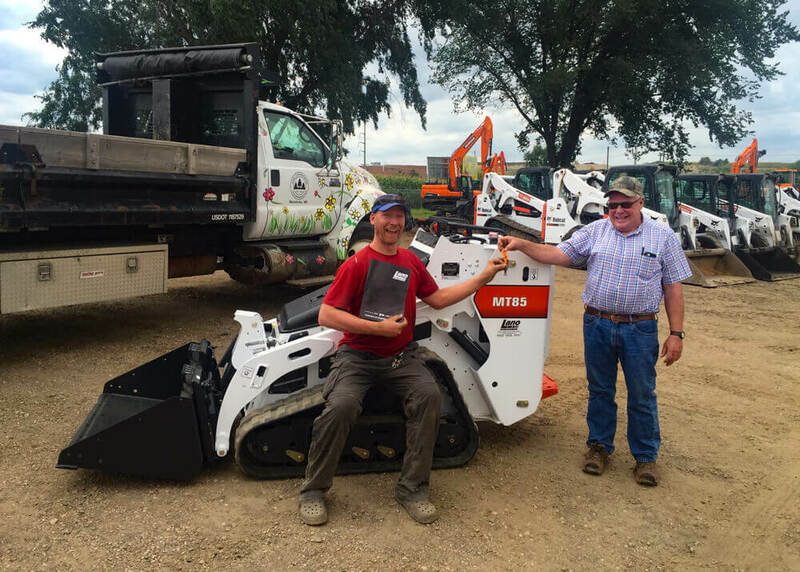 In 2016 we also purchased a new small tracked Bobcat machine for fitting into tight spaces and smaller back yards. We’ve had one for ten years, and they finally came out with a new, much-improved version, which can carry more but remains the same physical size. This equipment is fabulous for city lots, fenced areas, and for anything where the big machines would cause damage we want to avoid. 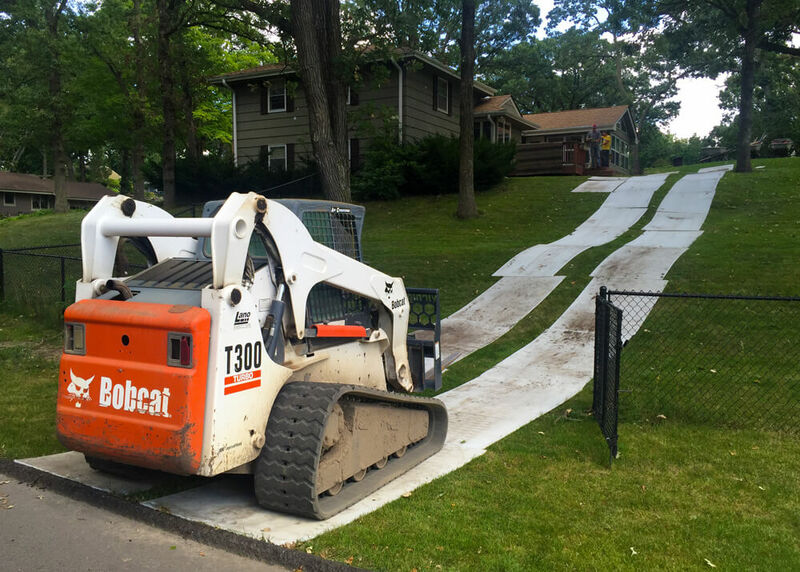 It’s incredible the work we can get done even when we only bring the small machine onto the property and just use a wheeled Bobcat to load and unload in the street. We bring the small machine to every job. By the time the crew and I get there, everything is figured out and ready to go. And we have years and years of practice at this. Literally thousands of projects. We will go from start to finish on your project as intelligently and efficiently as possible, using the best equipment money can buy to do the best job that can be done. 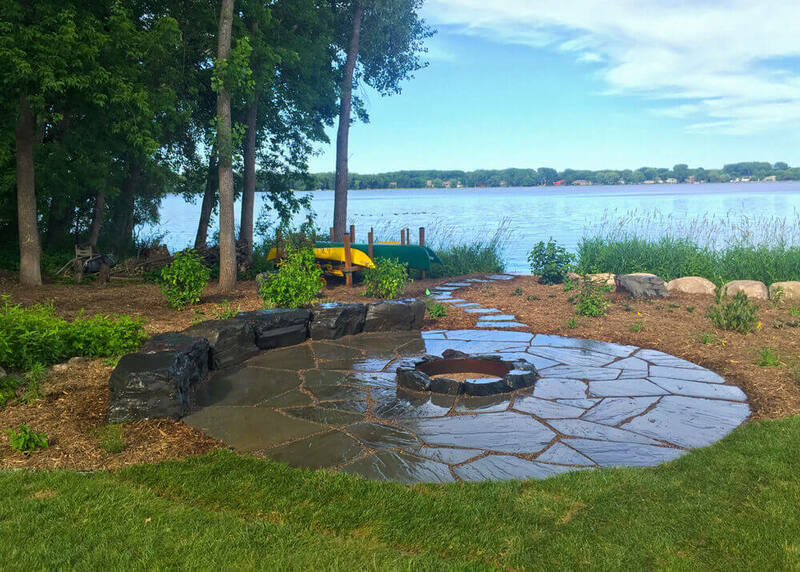 We will be focused and paying very close attention to all the little details you and Jodi have worked into your design, whether we’re in the hot sun or freezing rain. This is what we do, and we’ve been doing it a long time. We want it to be as smooth and stress free for both you and us as it is possible to be, and to leave you with a totally awesome new landscape when we go. Which brings me around again to the lawn damage, which you hopefully won’t have. 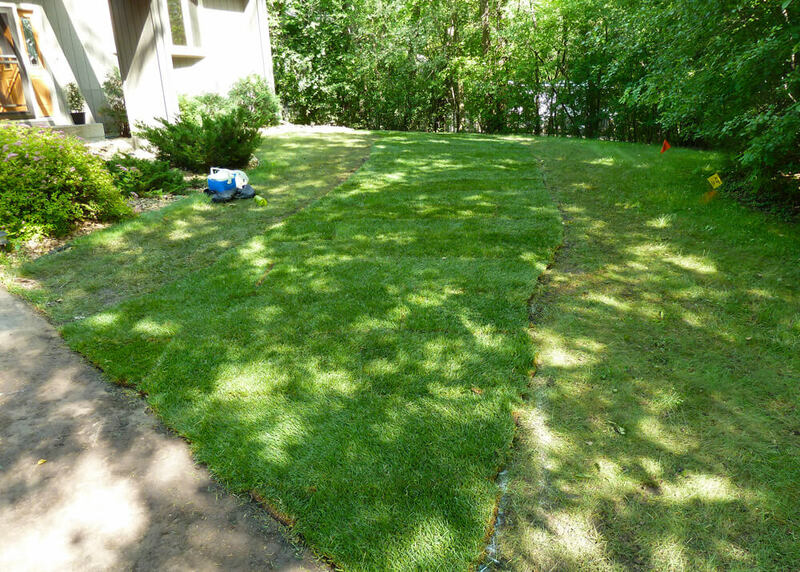 Our approach to handling lawn damage sets the tone for how we approach everything. I can’t wait to come to your place and make you something cool without wrecking the lawn. You’ll hardly believe it’s possible. We’re available to talk any time, so feel free to contact us and get started working with Jodi on your new project!